Tis the season to be jolly....Christmas is a time of celebrations, good food and warm cheer. Anticipation of Santa with his sack stuffed of presents excites children worldwide. In the meantime, they are reminded to be good or they could end up with a lump of coal in their Christmas stockings. Oh, you better watch out! The young in Austria, Germany & Switzerland have known these words very well. It is a warning...and they tremble at the mere mention of Krampus, a malevolent and devilish creature, complete with large horns and hoofed feet. 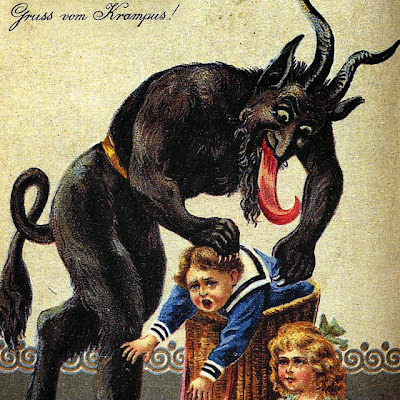 Whereas the Western version of Santa Claus is in charge of both rewards and punishments for good and bad children respectively, the Alpine Saint Nicolas only distributes rewards while Krampus delivers the punishments. The name “Krampus” is derived from the old German expression for claw,' referring to the menacing appearance of the creature. Depending on the area where the celebrations are taking place, the creature's name and appearance can vary slightly. Unlike our tradition of Santa delivering presents in the wee hours the morning of December 25th, the European Saint Nicolas visits children on December 6th, which commemorates the original real-life saint’s day. 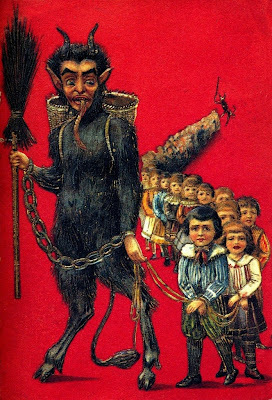 According to the customs, Krampus tags along with Saint Nicolas or precedes him on December 5th to deliver punishments to bad children on this day. The practice dates back several thousands of years ago when supposed witches or troublemakers would don sinister costumes and run around the streets to scare the townspeople. Later, the pagan religions observed the approach of the harsh winter season in a similar manner with actors dressed in creepy costumes. 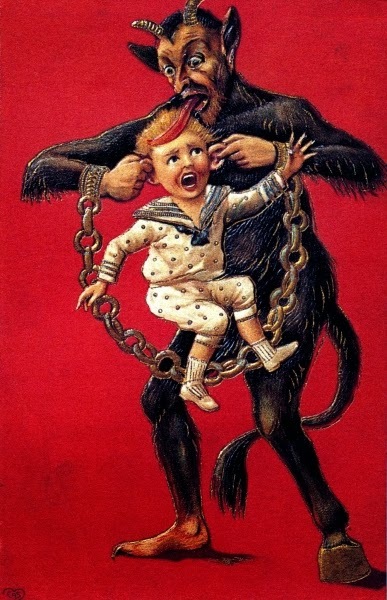 Drawing from this influence, Krampus costumes today can range from a scary-looking old man mask to a horrific devil-like creature covered in dark fur, bearing a long-fanged grimacing mask and animalistic eyes. They wield an assortment of fear-inducing noise-makers, such as heavy chains, whips and loud, clanging bells, as well as a basket meant to carry away naughty children. 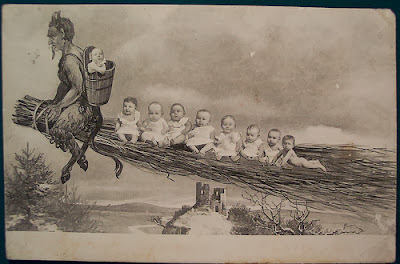 Goat-Headed Christmas Cheer: Run, Kris Kringle, Krampus Is Coming! 2000 BCEEnkidu appears in the Epic of Gilgamesh, the earliest known appearance of a 'Wild Man' in literature. 600 BCE In the book of Daniel in the Old Testament, King Nebuchadnezzar is punished by God for his pride when he is turned into a hairy beast. 217 BCE Saturnalia is introduced as a winter celebration in Rome, marked by gift giving, wild parties, and a reversal of the normal social roles of slave and master. 4th Century CE Due to Roman influence, many Germanic tribes, such as the Goths and Vandals, convert to Christianity; their pagan traditions survive in small villages in the Alps where the Church cannot penetrate. 1250 CE King's Mirror, a Norwegian text, features a Wild Man character who is described as being covered in hair. 17th Century CE 'Knecht Rupert' appears as a figure in a Nuremberg Christmas procession. 1810 CE The Brothers Grimm began publishing stories of Germanic folktales, marking a resurgence in Germanic pagan folklore. Early 19th Century CE Holiday postcards from Austria, Germany, and other parts of Europe feature holiday greetings Krampus and other companions of St. Nicholas. Early 19th Century CE Germanic and Dutch immigrants to the US popularize 'Pelznickel' traditions in Pennsylvania, Maryland, and as far west as Indiana. 2004 CE Blab! Magazine curator Monte Beauchamp publishes Devil In Design, a collection of vintage Krampus postcards from the turn of the 19th century. 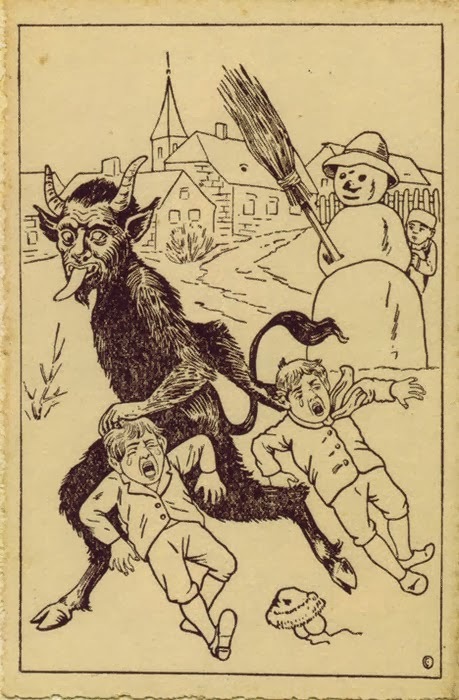 This book marks an increase in Krampus' popularity in the English speaking world. 2004 CE An Adult Swim show The Venture Brothers features Krampus during a Christmas special. 2007 CE The American television show Supernatural features an evil Krampus character. 2009 CE American satirist Stephen Colbert is visited by Krampus on his television show The Colbert Report. 2013 CE 'Grimm: Twelve Days of Krampus' - aired 12/6/2013 - A DARK JUSTICE DESCENDS ON PORTLAND AS THE CHRISTMAS SEASON BEGINS -- After a string of delinquent teens go missing, an old Wesen tale of an evil Santa who brings more than just a lump of coal may be the prime suspect. The investigation intensifies as Nick (David Giuntoli) and Hank (Russell Hornsby) take things a little too far. Meanwhile, Monroe (Silas Weir Mitchell) enlists Juliet (Bitsie Tulloch) to surprise Rosalee (Bree Turner) for their first Christmas together with unintended results. Elsewhere, Captain Renard’s (Sasha Roiz) tour of Europe brings him closer to tracking down Adalind (Claire Coffee). Reggie Lee also stars.